Ah practicing. The wonderful, wonderful part of being a musician. I actually thoroughly enjoy it, but that’s just the inner music teacher in me speaking, and I must profess my love of practicing, so my students will also come to love it as I do, right? Honestly speaking, practicing used to be a chore for me. In fact, my mom used to have to force me to write it into a schedule that I had to follow each day, because let’s face it, most kids my age would’ve rather been running around outside or watching TV instead of doing homework and practicing. So for awhile it was a chore, until I made the conscious decision to become a professional, but even a professional faces practice hurdles. While tackling a particularly lackluster lull in practicing, one of my friends posted this Bulletproof Musician article. In it, Dr. Kageyama explores the question “how many hours a day should I practice” and comes back with an in-depth analysis of what makes effective practice, mainly quality of practice over quantity. This was an eye opening article for many reasons: 1. I had always thought the longer I practiced, the better. 2. I realized how poorly I had planned out my practice sessions. and 3. It forced me to rethink my entire approach towards practicing, and really helped me out of the practicing rut. It even sparked the keeping of a practice journal. The journal itself had been recommended by a graduate student, but really did wonders. Suddenly, practice sessions made sense. I was able to track my goals better, as well as take notes about pieces, so that specific practice targets would be made and met by the following practice sessions. Around this time, I also developed a set of personal practice rules. While rules will differentiate between people, it did help to solidify ideas into something simple to achieve by the end of each session. It also helped create more structure, and gave specific markers to look for while practicing. It also helped immensely to listen to recording of pieces before playing them through. The first time you tackle a piece may feel overwhelming, but a certain amount of preparation should go into it, so you know what to lookout for. Namely, listen to the piece with your score out, and make markings along the way. The markings should make sense to you, and help you interpret the music. If it’s an orchestral piece, it’ll help you see how your part fits in, if it’s a solo piece, it’ll help you see what certain passages can sound like. Other things to keep in mind: it’s just a practice session. Make it as fun and engaging for yourself as possible, it’ll only help you get over the slump. Find what motivates you, and what methods will help you organize your session better, and stick with it. It’ll help those extra awful practice days go by better. These things helped me not only visualize a session going in, but also helped put the grueling amounts of practice into perspective. You only have 2 hours to practice? Formulate your plan for that. You’ll be surprised by what you can accomplish in that time, and I promise, the more you can do to organize those thoughts and help engage yourself better, the less likely you’re going to hit a major practice slump. There are a lot of career paths that I’ve always envisioned myself going down. In elementary school it was a firefighter, until someone told me that girls couldn’t do that, so then I changed courses. My thoughts ran to what my mom did, which was nursing, so for awhile I thought, “Oh, I want to do that too!” By high school, my heart was dead set on becoming a biochemical engineer, to cure cancer. And then….funniest of things happened. I was so incredibly bad at chemistry, and only slightly OK at biology. Senior year of high school hit, and the question of “what are you going to college for?” became a recurring theme. After a lot of thinking, music became the clearest choice. But why music specifically? I realized how big a part music was playing in my life. 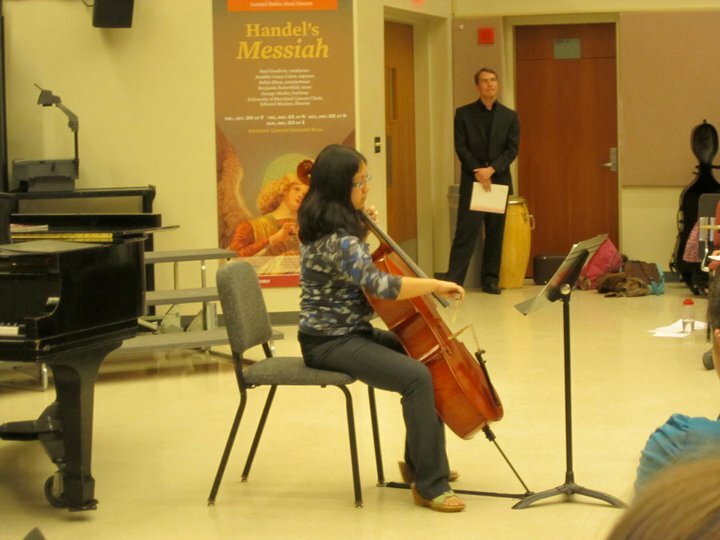 I loved playing the cello, and I wanted to pass along how great music made me feel to the next generation of kids. Things started to add up. Teaching and music were things that I was good at, and things I enjoyed. The more I thought about it, the more it seemed like the right fit. Music has taught me important skills: organization, time management, planning, leading, seeing the big picture, being detail oriented, teamwork, and communication. All skills that helped with my first career, and skills that I take with me in my everyday life. The past several years have shown that music draws people together, but also provides the strength and compels necessary change. One of my students, from when I was still in the public schools told me once, “Ms. Wang, I was having a bad day yesterday, but then I picked up my violin, played, and knew everything would be OK.” This is the impact of music. Something for people to turn to, not only in times of need, but also as a way to express themselves. Philip Pullman put it best when he said, “Children need art and stories and poems and music as much as they need love and food and fresh air and play.” His blog post goes more in depth. And it’s not just children. There have been other adults and friends I’ve talked to, who have described experiencing music in a powerful way. Was it the right choice? Yes. Best decision ever. For sure, there have been struggles, and this hasn’t been the easiest of paths, but, I would never, ever change a thing. So, why music? Music has helped me. Music has been my one constant in life. That’s why I chose music.